PT Sarana Multigriya Finansial (Persero) - SMF or referred to as "SMF Indonesia" is the Indonesia Secondary Mortgage Corporation. SMF Indonesia is a reputable state-owned financial services company in Indonesia with core business competencies in the field of secondary mortgage industry. SMF Indonesia engaged in disbursing funds from the capital market to mortgage lenders. SMF Indonesia is a non-listed state-owned company and is 100% owned by the Government of Indonesia. PT Sarana Multigriya Finansial (Persero) was formed by the Government of Indonesia in 2005 with main tasks to promote and to develop secondary mortgage market (PPSP) in Indonesia. 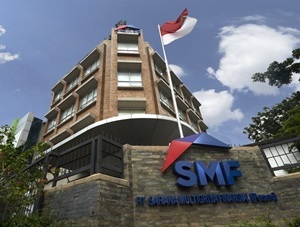 SMF Indonesia has its legal domicile in Jakarta and its head office is located at Jl Panglima Polim I No 1 Jakarta 12160. In term of financial performance, SMF Indonesia has recorded a significant growth and satisfactory performace in 2017. According to information found in PT Sarana Multigriya Finansial (Persero) Annual Report 2017 as cited by JobsCDC.com, SMF Indonesia reported total assets of Rp 15,662.58 billion in 2017 or an 19.35% increase from Rp 13.122.29 billion in 2016. Revenues continue to grow by 20.31% to Rp 1,178.92 billion from Rp 978.89 billion in 2016. Total comprehensive income in 2017 booked a 32.29% growth, reaching Rp 412.63 billion from Rp 311.90 billion 2016. JobsCDC.com now available on android device. Download now on Google Play here. Please be aware of recruitment fraud. The entire stage of this selection process is free of charge. PT Sarana Multigriya Finansial (Persero) - Staff, Coordinator, Head SMF Indonesia October 2018 will never ask for fees or upfront payments for any purposes during the recruitment process such as transportation and accommodation.